Iron Man tries to enlist help in finding the Hulk. There are lots of guest stars. Than the Avengers: Iron Man. Thor, Ant-Man and Wasp find him. The art and story telling are classic. The art will simply blow you away. The story keeps you reading wanting to get to the next page. 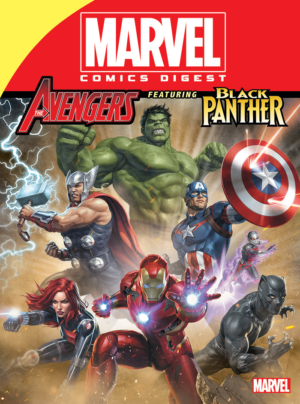 Seeing the Avengers battling it out with Namor and the Hulk is more action and excitement then you will be able to stand, so have a seat and enjoy this story to its fullest. This story is about the Avengers finding and reviving Captain America. Than the Avengers need rescuing and Captain America goes into action. This is how he was meant to be illustrated. Namor makes an appearance and puts up a fight. The Avengers working together as a team battle Namor and his forces. The story just flows so smoothly and the art is stunning. “Behold…The Vision!” The Vision attacks the Wasp. Hawkeye and Black Panther are in this story as well. The story though does focus on the Vision. The Vision makes his choice on whether to be a hero or villain. Ultron makes his move and we are shown he is one evil android. “Even An Android Can Cry” Here the Vision petitions for membership in the Avengers. Ultron sure has changed a lot in appearance since he was first created. The Vision may not be flesh and blood but here we see that even an android can cry. It is a touching scene of acceptance. The Vision is so well illustrated here it is a pleasure to look upon him. “All The Sounds and Sights of Death!” Both Mantis and the Scarlet Witch have a crush on the Vision. While the Swordsman loves Mantis. The romantic problems of an Avenger. Now Klaw and Sonarr attack the Avengers. The Black Panther steps up and uses his mind as much as his brawn to fight these foes. The art is gorgeous and showcases all the heroes and villains in glorious detail. “The Replacements” The Avengers in this tale are Captain America, Storm, Hulk, Spider-Man, Giant-Girl, Iron-Man and Wolverine. They face the threat of Utron. The art has our heroes in some great poses. In this younger age comic the Avengers have fun battling Ultron. “Finding Zemo” Baron Zemo looks impressive in his big robot war machine. As the Avengers assemble Baron Zemo unleashes his War-Walker Omega robot. This thing is a deadly drawn machine of death. Great art and a great fun story make for a amazing time for those reading this. “Enter the Mandarin” The art here is a more cartoon style as fits for a younger reader audience. Fin-Fang-Foom the dragon is attacking the Avengers Tower. The Avengers find using brains works better and makes the task easier than using brawn. The Mandarin makes for a great foe though. “King Solomon’s Frogs” Hawkeye and Black Panther have fun with Kang and Ravonna. This is a simple story with simple art. Hawkeye we find out does not like time travelling. It is funny to see his reactions to it. “The Serpent Crown” The Serpent Society lead by Viper face the Avengers. Set the giant serpent demon decides Viper is an enemy to. So we get a free for all against Set while the Avengers still battle the Serpent Society. The battle comes down to a battle of wills and no will is stronger than Captain America’s. The art again has a cartoon style to it. “Ghost of a Chance” by Man of Action & Paul Giacoppo and adapted by Joe Caramagna. A dimensional breach leads to a invasion from another dimension. The Avengers as usual stand ready with their newest member the Falcon being their best hope of victory. The Falcon fits right in with his new team the Avengers. The story line has some fun moments to it that will make you smile. The Avengers are Earth’s Mightiest Heroes and they stand ready to fight any evil that threatens the planet.